For the full CHAOS experience, turn your sound on ! at Lester B. Pearson International Airport. 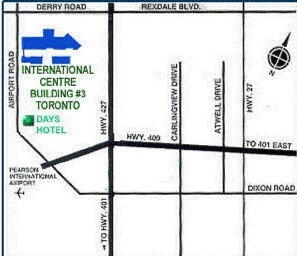 The rate is $109/night Canadian (doesn't include tax) regardless if you have 2, 3, or 4 persons in your room. All of the rooms are in Steve Benninger’s name. He will update everyone with confirmation numbers shortly. They have their own "free” shuttle from the airport, the cost is $6. 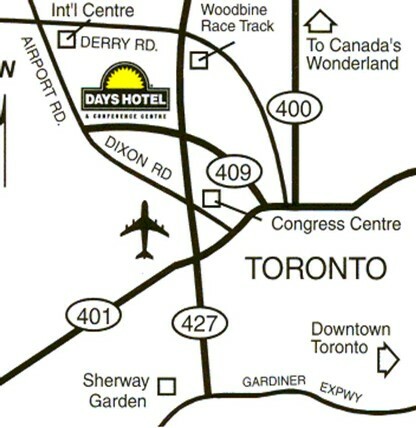 Take Hwy 400 south to Hwy 401 west. Follow Hwy 401 to Hwy 409 west. Exit on Airport Road and turn right. Drive. Hotel is on left, 1st driveway. Take Hwy 401 west to Hwy 409 west. Road. Turn left on Dixon Road. the hotel is on the left, 1st driveway. stay to the right and exit on Dixon Road.